Read the most common questions asked with finding an ankle surgeon. Searching for the best ankle surgeon in Orange County is not an easy task. Thankfully, there are a few good online resources you can use to help you out. This site will go over some frequently asked questions. Take a look at the doctor’s credentials when looking for a the best ankle surgeon in Orange County. What is the purpose of a fellowship for an ankle surgeon in Orange County? During a fellowship, an extra year is spent learning the complex surgeries of the foot and ankle. More skill is developed and many more surgeries are done on the foot and ankle. Does it matter where the ankle surgeon did their residency? It absolutely matters where a residency was done. During residency is where most of the learning happens. That means that the best places to learn are highly ranked hospitals. Our doctors were trained at top institutions around the country. They came from the best programs. A Board certified Podiatrist has passed extra written testing provided by their board. It is a higher level of standard. Where can I search the license of a Podiatrist? It is important to look and make sure that the Podiatrist does not have any violations against them. Check the California Podiatry Medical Board Website. 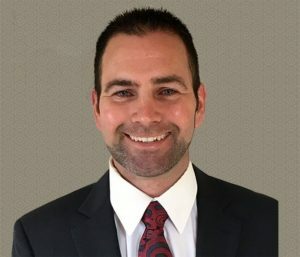 What is the best way to get a good recommendation on an ankle surgeon in Orange County? 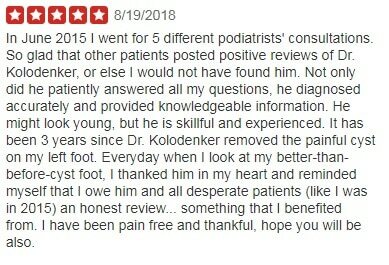 I always recommend to read the reviews written about the surgeon before going in when looking for the best foot surgeon. Ask your friends or primary care doctor. See our patient reviews. The most honest review site is Yelp. Healthgrades is another good one. What should I do expect when visiting my ankle surgeon? Once you make it in the office, it is important that the relationship with the doctor is comfortable. You should not feel pressured or rushed. It is best to write down all your questions so that you will remember what to ask. Be honest. The treatment process should make sense. Be careful if someone is trying to sell you something. The doctor should go over all your questions. Not all questions have answers. We always give patients the email of our doctors. Will my insurance pay for a second opinion? Use your common sense and do not be afraid to obtain a second opinion. Our office frequently sees foot and ankle pain or surgery patients for a second opinion. It is a good way to double check. You do not need to switch doctors after a second opinion. How do I contact OCPodiatry? Fellowship trained in Sports Medicine and Surgery of the Foot and Ankle. We do simple and complex surgeries. Feel free to post any questions you might have on our Facebook Page. We have also brought on two very talented ankle surgeons, Dr. Coyer and Dr. Vincent. 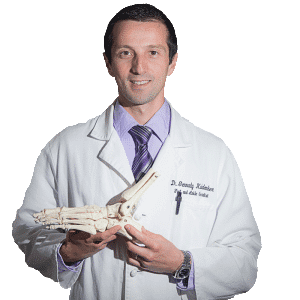 Dr. Gennady Kolodenker, DPM is a highly reviewed Sports Medicine and Surgery Fellowship Trained Foot and Ankle Surgeon in Orange County California. He now practices Adult and Pediatric Foot and Ankle Surgery and Medicine in Southern California, Irvine – Orange County. 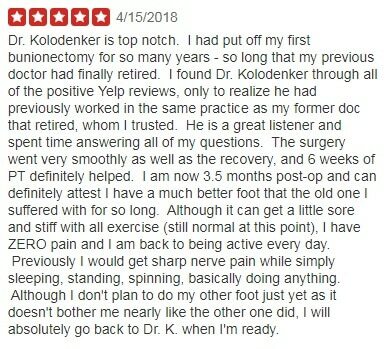 Dr. Kolodenker is a Foot and Ankle Surgeon at Hoag Newport Beach and Irvine. He is also a Podiatrist on staff at CHOC in Orange. Dr. K specializes in complex and simple adult and pediatric foot and ankle surgery. Procedures range from ankle fractures, foot fractures, torn tendons and ligaments, painful arthritis, joint replacement surgery to bunion and hammer toe surgery, and neuroma excision. He is an expert in wound management along with diabetic and charcot reconstruction. View our website for the entire list of conditions treated. Dr. Kolodenker is Clinical Assistant Professor at Western University of Health Sciences. He is also a Qualified Medical Evaluator (QME) here in Orange County – Southern California. We can also perform an Independent Medical Evaluation (IME) along with expert testimony. He completed a three year surgical foot and ankle podiatry residency at University of Medicine and Dentistry in Newark, NJ (UMDNJ). 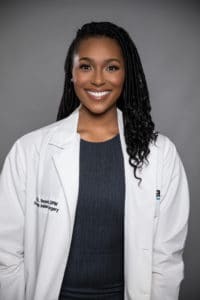 During residency he was taught by general orthopedic surgeons, podiatrist, and foot and ankle specialized orthopedic doctors who were trained at Hospital for Special Surgery in New York. The UMDNJ residency provided Dr. Kolodenker with vast experiences in trauma, limb preservation, reconstructive surgery, and cosmetic foot and ankle surgery. He finished his four year medical school training at Dr. William M. Scholl College of Podiatric Medicine in 2007. The school was established in 1912 and became a member of the Rosalind Franklin University family in 2001. The College is accredited by the Council on Podiatric Medical Education and the North Central Association of Colleges and Schools/The Higher Learning Commission.